Akzo Nobel Specialty Chemicals organized the finals of their Imagine Chemistry Challenge 2018 with KPMG in Gothenburg, Sweden. 20 finalists out of 150 applicants were invited with their contributions, amongst them us from VTT. Beforehand, the finals were described as a pressure cook event and that was pronounced by hot and sunny days. We were treated with a high-class dinner with our mentors Joke Speelman and Donovan Thompson along with sponsors, experts and CTO Peter Nieuwenhuizen. During the week, we attended keynotes and masterclasses at the main venue, Chalmers Ventures. Focus was on nine individual sessions, allowing for development of our case closer to market together from multiple aspects (strategy, sustainability, cost). In the competition, VTT contributed with a technology for a flexible wood-based (hemicellulose) platform for surfactants. The technology has been developed during the last 15 years with focus on other end uses. Material can be produced in pilot scale and the idea aimed at addressing the multi-billion specialty surfactant business. The technology needs still development to be tailored for the application as surfactant. Polymeric hemicelluloses are not yet commercially available even though there is interest for them as raw material for polymeric chemicals. Finally, we submitted a summary to the jury. Also all experts gave their input directly to the jury. – Fero Labs for their machine learning software. The Research agreement was awarded to the University of Nottingham (UK) for developing porous microspheres from glass and glass ceramic materials aiming at e.g. water treatment. VTT did not win an actual prize, but the learnings and the experiences during the intensive days were extensive. During the event, we met so many inspired, happy and interesting people – thank you. We learned a lot about working together for a common goal as well as the fact that bringing a technology or product to market is not only a matter of technology development, but also needs value chain development, which takes time. The event can be recommended to start-up companies and research institutions with technologies in medium to high TRL levels in relevant areas for Akzo Nobel. If you are interested, follow the news on the Imagine Chemistry web pages to get information on the next event. When will we see the new products and technologies in production? 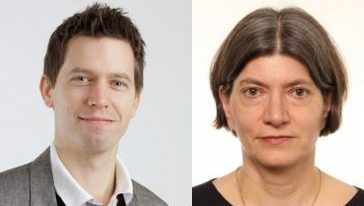 The authors Christiane Laine and Jonas Hartman are from VTT Technical Research Centre of Finland Ltd.
Christiane Laine, Senior Researcher, R&D of materials and chemicals from natural resources. Jonas Hartman, Solution Sales Lead, Sustainable Energy and Chemistry, Sales and Customer Partnerships.